Another short one this time round – on Tuesday I had the absolute pleasure of chatting to one of Jersey’s absolute House pioneers, Ace Mungin. We talked about his early days in Jersey, setting up Ace Beat records and working with Blaze on their first records – with any luck I’ll get that written up for the next post. In the meantime, I’m going to become even more indebted than usual to Mr Richard Jefferys by sharing a few youtube videos (I’m still calling them videos…) he posted recently. Richard’s RJJNY youtube channel is probably the source of about 75% of what I now know about New York house music, so this is a good opportunity to say thanks for all the music Richard! 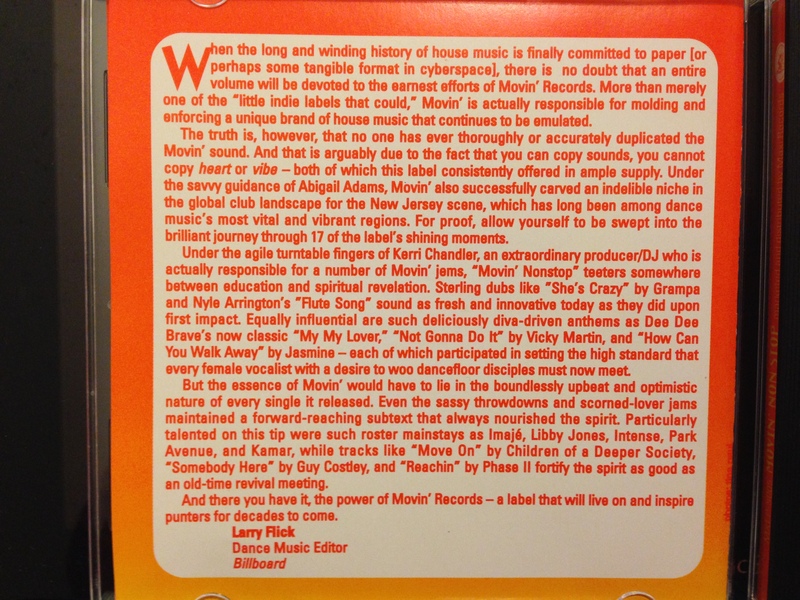 I doubt Larry had something quite this amateurish in mind when he was considering what “some tangible format in cyberspace” might look like (dial up internet was only just coming out that year), but a volume’s worth of Movin’ music seems fair enough to me.